Y. H. Fan, H. Ren, X. Liang, H. Wang, and S. T. Wu, "Liquid crystal microlens arrays with switchable positive and negative focal lengths" J. Display Technology 1, (Sept. 2005). Y. H. Lin, H. Ren, Y. H. Fan, Y. H. Wu, and S. T. Wu, "Polarization-independent and fast-response phase modulation using a normal-mode polymer-stabilized cholesteric texture", J. Appl. Phys. 98, 043112 (August 15, 2005). Y. H. Fan, H. Ren, and S. T. Wu, "Electrically switchable Fresnel lens using a polymer-separated composite film" Opt. Express 13, 4141-4147 (May 30, 2005). H. Ren, Y. H. Lin, Y. H. Fan, and S. T. Wu, "Polarization-independent phase modulation using a polymer-dispersed liquid crystal", Appl. Phys. Lett. 86, 141110 (April 4, 2005). H. W. Ren, Y. H. Fan, Y. H. Lin, and S. T. Wu, "Tunable-focus microlens arrays using nanosized polymer-dispersed liquid crystal droplets", Opt. Comm. 247, 101-106 (March 1, 2005). H. W. Ren, J. R. Wu, Y. H. Fan, Y. H. Lin, and S. T. Wu, “Hermaphroditic liquid crystal microlens," Opt. Lett. 30, 376-378 (2005). H. W. Ren, Y. H. Fan, Y. H. Lin, and S. T. Wu, “Tunable-focus microlens arrays using nanosized polymer-dispersed liquid crystal droplets," Opt. Comm. 247, 101-106 (2005). Y. H. Wu, Y. H. Lin, Y. Q. Lu, H. Ren, Y. H. Fan, J. R. Wu and S. T. Wu, "Submillisecond response variable optical attenuator based on sheared polymer network liquid crystal," Opt. Express 12, 6377-6384 (2004). Y. H. Fan, H. Ren, X. Liang, Y. H. Lin, and S. T. Wu, "Dual-frequency liquid crystal gels with submillisecond response time," Appl. Phys. Lett. 85, 2451-3 (2004). H. Ren, Y. H. Lin, Y. H. Fan, and S. T. Wu, "In-plane switching liquid crystal gel for polarization independent light switch," J. Appl. Phys. 96, 3609-3611 (2004). H. Ren, Y. H. Fan, S. Gauza, and S. T. Wu, "Tunable-focus flat liquid crystal spherical lens,” Appl. Phys. Lett. 84, 4789-91 (2004). H. Ren, Y. H. Fan and S. T. Wu, “Liquid crystal microlens arrays using patterned polymer networks," Opt. Lett. 29, 1608-1610 (2004). Y. H. Fan, Y. H. Lin, H. Ren, S. Gauza and S. T. Wu, “Fast-response and scattering-free polymer network liquid crystals for infrared light modulators,” Appl. Phys. Lett. 84, 1233-5 (2004). H. Ren, Y. H. Fan, S. Gauza and S. T. Wu, “Tunable microlens arrays using polymer network liquid crystal," Optics Comm. 230, 267-71 (2004). H. Ren, Y. H. Fan, and S. T. Wu, “Polymer network liquid crystal for tunable microlens arrays,” J. Phys. D: Appl. Phys. 37, 400-3 (2004). H. Ren, Y. H. Fan, S. Gauza and S. T. Wu, “Tunable-focus cylindrical liquid crystal lens,” Jpn. J. Appl. Phys. 43, 652-3 (2004). Y. H. Fan, H. Ren and S. T. Wu, “Switchable Fresnel lens using polymer-stabilized liquid crystals,” Optics Express 11, 3080-6 (2003). H. Ren, Y. H. Fan and S. T. Wu, “Tunable Fresnel lens using nanoscale polymer-dispersed liquid crystals,” Appl. Phys. Lett. 83, 1515-7 (2003). H. Ren, Y. H. Fan and S. T. Wu, “Prism grating using polymer-stabilized liquid crystal,” Appl. Phys. Lett. 82, 3168-70 (2003). Y. H. Fan, H. Ren and S. T. Wu, “Normal mode anisotropic liquid crystal gels,” Appl. Phys. Lett. 82, 2945-7 (2003). A. Spadło, R. Dąbrowski, M. Filipowicz, Z. Stolarz, J. Przedmojski, S. Gauza, Y. H. Fan and S. T. Wu, “Synthesis, Mesomorphic and optical properties of isothiocyanatotolanes,” Liq. Cryst. 30, 191-8 (2003). T.-C. Ko, Y.-H. Fan, M.-F. Shieh, A. Y.-G. Fuh, C.-Y. Huang, M.-S. Tsai and I-M. Jiang, “Diffraction from polymer-stabilized cholesteric texture films,” Jpn. J. Appl. Phys. 40, 2255-8 (2001). A. Y.-G. Fuh, M.-S. Tsai, C.-R. Lee, Y.-H. Fan, “Dynamical studies of gratings formed in polymer-dispersed liquid crystal films doped with a guest-host dye,” Physical Review E 62, 3702-7 (2000). A. Y.-G. Fuh, M.-S. Tsai, Y.-H. 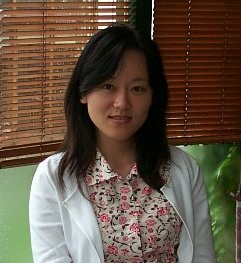 Fan, C.-R. Lee, K.-Y Lo, “Dynamic studies of polymerization in liquid crystal-polymer mixtures,” J. Appl. Phys. 86, 6652-6 (1999). A. Y.-G. Fuh, M.-S. Tsai, C.-R. Lee, Y.-H. Fan, “Diffraction from a one-beam generated hologram on a polymer-dispersed liquid crystal film,” Optics Communications 167, 53-6 (1999). Y. H. Fan, H. Ren, and S. T. Wu “Tunable-focus microlens arrays for display applications” 17th IEEE/LEOS Annual Meeting, pp. 41-42 (Puerto Rico, Nov. 8-11, 2004). Y. H. Fan, Y. H. Lin, H. Ren, S. Gauza and S. T. Wu, “Fast-response polymer network liquid crystals for optical communications”, SID Tech. Digest 35, 1526-9 (2004). (Invited paper) Y. H. Fan, H. Ren, and S. T. Wu, “Electrically controlled lens and prism using nanoscale polymer-dispersed and polymer-networked liquid crystals,” Proc. SPIE 5289, 63-73 (2004). (Invited Paper) H. Ren, Y. H. Fan and S. T. Wu, “Anisotropic liquid crystal gels for display applications,” Proc. International Display Manufacturing Conference, pp. 29-32 (2003). (Invited paper) C. H. Wen, Y. H. Fan, S. T. Wu, R. Dabrowski, O. Catanescu and L. C. Chien, “Side chain effects on high birefringence liquid crystals,” Proc. SPIE 4658, 28-34 (2002).